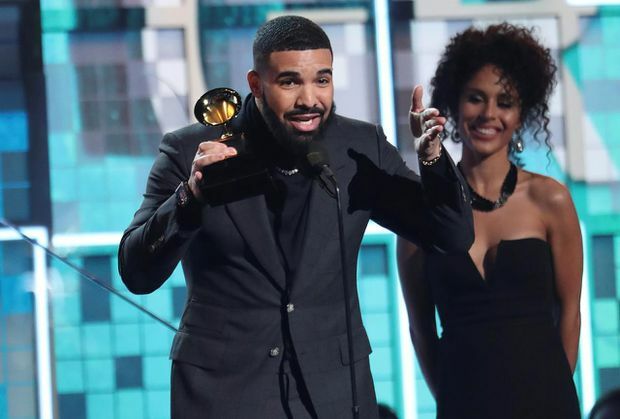 Drake accepts the award for best rap song for 'God's Plan' at the 61st annual Grammy Awards, in Los Angeles, Calif., on Feb. 10, 2019. Struggling to stay relevant and attempting to please everyone, the Grammys on Sunday rebounded from last year’s public relations debacle with a corrective, earnest and often awkward televised ceremony. Female artists dominated, hip hop made history, platitudes ruled and Drake surprised everyone – first by showing up in person to accept an award and then by tossing a stink bomb into the proceeding at Staples Center in Los Angeles. Throw in a pop-in from Michelle Obama, an array of outrageously emotive performances and a few notable no-shows, and viewers were left with one of music’s most unpredictable nights in memory. The oddest moment surrounded the song This Is America, a politically themed song and accompanying provocative video from Childish Gambino (a.k.a. Donald Glover, the actor and musician). In protest against the Grammy’s poor track record with hip hop, Gambino, Drake and Kendrick Lamar all declined offers to perform on this year’s show. The Grammys, which have a history of compensating for award snubs, pivoted this year by voting This Is America the song of the year and record of the year, the first-ever wins for rap in those major categories. But Gambino failed to show up, leaving a white, Swedish producer (Ludwig Goransson) to make an acceptance speech about a racially charged American anti-anthem. “It calls out injustice, celebrates life and reunites us all at the same time.” Goransson said. He went on to say that rapper 21 Savage “should be here right now.” The reference to the London-born, Atlanta-based rapper, who was up for a pair of awards but was recently arrested for overstaying a visa, was a rare edgy moment during a nearly four-hour broadcast that relentlessly flogged a power-of-music message. Lady Gaga, Jennifer Lopez, Alicia Keys, former first lady Michelle Obama and Jada Pinkett Smith at the Grammys. The night’s controversial moment came when the world’s biggest recording artist, Drake, accepted the best rap song award for God’s Plan by throwing shade at the Recording Academy. In 2018, the Toronto-born superstar boycotted the Grammys. Extended an olive branch by the Academy this year, Drake took it with a clenched fist of grievance. The telecast then abruptly cut to a commercial. This 61st Grammys were the last to be helmed by outgoing Academy president Neil Portnow. A year ago, he responded to the conspicuously female-light list of major Grammy winners by suggesting women needed to “step up” if they wished to be recognized at the ceremony. After his remarks prompted a furious backlash, Portnow announced he would step down. 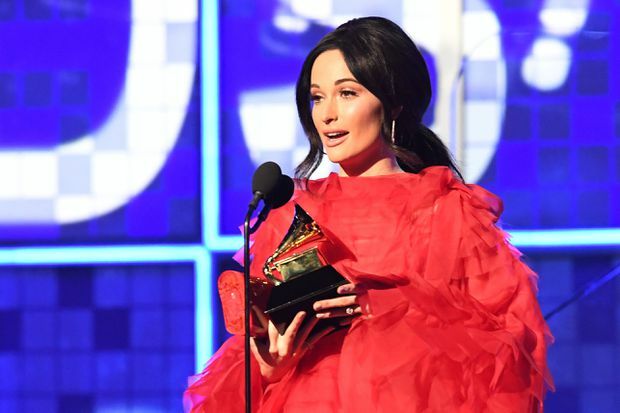 Kacey Musgraves accepts the award for album of the year for 'Golden Hour' onstage during the Grammys. Musgraves, along with Brandi Carlile, represents a changing of the Nashville guard, with music that is defiant and socially conscious. Carlile won half of her surprising six nominations and further established herself with a dramatic performance of The Joke, an anthem for the marginalized. Equally inspiring was Cardi B, who became the first woman to win in the best rap album category for her LP Invasion of Privacy. In her acceptance speech, the Bronx-raised dynamo mentioned the rush to finish the record. Pregnant at the time, she needed to shoot the videos before she was showing. What could better demonstrate the uniquely female experience in the music business? Cardi B’s vamping, peacocking live performance of her hit song Money was a showstopper that balanced out a night damaged by an overwrought Lady Gaga, a seemingly distressed Katy Perry and a Motown tribute inexplicably handled by Jennifer Lopez. Cardi B performs onstage at the Grammys. Better was the celebration of Dolly Parton, featuring the country legend herself. James Ehnes, best classical instrumental solo, for Kernis: Violin Concerto. Greg Wells, best compilation soundtrack for visual media, for his work on The Greatest Showman. Daniel Caesar, best R&B performance, shared with H.E.R., for their song Best Part. Willo Perron, best recording package, for his work on the St. Vincent album Masseduction. Lili Haydn, best new age album, as part of Opium Moon, for the quartet’s self-titled album.